First of all, I’ve got to thank my cousin, Vince Nardy, from whom I borrowed this picture. He posted it on Facebook, I thought it was pretty cool, and it started my thought process. Thanks, Vince! For twenty years, I worked in the pharmaceutical industry, mostly in the training department. I had a great job. Basically, I had a hand in creating my own job description. I was involved in the creation, development, and implementation of training programs — initial sales training; product training; disease state training; technical training; skills training; and management and leadership training and development. I was involved in virtually every facet of training and development, but my favorite area was being in front of people — teaching, training, coaching, and developing. That’s my passion. Great opportunity, great compensation, and great job satisfaction (most of the time). But my dream was bigger than that. I wanted to (help) build the best training department — and training experience — in the pharmaceutical industry. I wanted every participant in our training and development workshops to leave feeling that they had just experienced a “best-in-class” training program. Then, a little over ten years ago, I learned that my job (and most of my department) was being eliminated. For years, the entire pharmaceutical industry had grown faster than it’s infrastructure could support, and now the pendulum was beginning to swing in the other direction. My severance was at the forefront of what would become a massive downsizing, both in our company and the industry. It was time to move on. Then, the dream process started again. Long story short, I took a severance package and started my own business — Athletic Performance Training Center — in April 2008. I had been developing this vision for years (and, sort of doing it “on the side,” in my basement and elsewhere, with my kids and some of their friends and teammates) but, I must admit, losing my job forced my hand. And, although there have been some “speed bumps” along the way, I haven’t looked back since. My undergraduate background is science based, and I completed post-graduate work in Exercise Science and Human Performance, and earned my certification, with distinction, through a highly respected, accredited organization – the National Strength and Conditioning Association (NSCA). With the help of a few other local small business owners, I developed a business plan. I enlisted the help of an attorney (a neighbor and family friend) to ensure that my business was set up legally, professionally, and registered with the state. Then I went to work networking with, and learning from, some of the brightest, most-respected, well-known names in the field of strength and conditioning. I still try to learn something new, every single day, that makes me better at what I do, and improves me as a resource to my clients. I never want to stop learning. Although my endeavor is categorized as a “small business,” my vision — my dream — is anything but. I have been dreaming big since opening my doors over ten years ago. I want to reach everyone, and help them reach their athletic performance, strength and conditioning, and fitness goals. We currently collaborate and partner with dozens of clubs, schools, teams, groups, and organizations. Additionally, I spend some time every day contacting coaches, athletic directors, administrators, employers, businesses, corporations, and program directors in hopes of discussing with them how we can be a resource to their constituency. We’re currently working with an organization to take our business (and workouts) online so that anyone can benefit from APTC training, regardless of where they live. Obviously, I publish this blog, posting once a week, but I also write for a handful of other publications, including STACK Media. I hope to reach and positively impact as many people as I can, on a national (and international) level. Another of my passions is public speaking, and I have been fortunate to have the opportunity to speak at several grade schools, middle schools, high schools, colleges, and other organizations. I have also had the privilege of speaking at local and regional NSCA sanctioned events. My dream, however, is to broaden my scope and speak more at the national level. I have recently been added (after much legwork) to a few national speaker’s bureaus, which have the potential to increase my exposure. 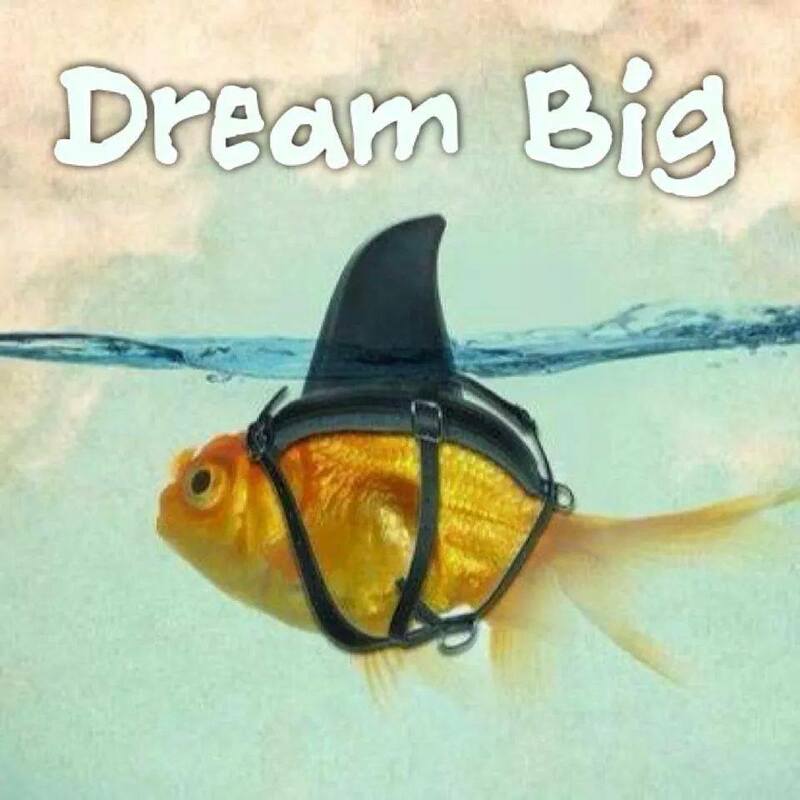 My point is this: DREAM BIG! Don’t aspire to make 50% of your shots (even though that’s a solid field goal percentage), aim to make all of them. Dream of a 1.000 batting average; a 100% free-throw shooting percentage; a 100% passing completion rate; a 4.0 grade point average. But don’t stop with the dream. You can’t just dream big and expect good things to happen, you’ve got to do something about it. Develop a plan of action, then WORK to make it happen. Do something, every day, to move yourself closer to your dream or goal. Surround yourself with people who believe in you and encourage you and, most importantly… BELIEVE IN YOU! I may or may not realize all my dreams but, if I don’t, it won’t be because I didn’t dream big, or for lack of effort. My dreams are still bigger than my achievements but, hey, that’s how it’s supposed to be… right?